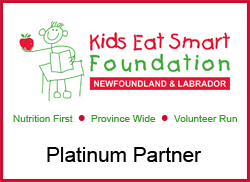 Credit unions in Newfoundland and Labrador collectively provide support to Kids Eat Smart (KES), and are proud to announce that they continue to be designated as Platinum Partners to the program. Doug Dewling (left), Chair of Public Service Credit Union and Atlantic Central/League Savings and Mortgage Company CSR Committee member, presents sponsorship cheque to Celina Stoyles of the Kids Eat Smart Foundation. 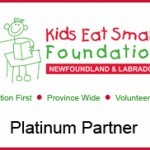 Since it began in 1992, the Kids Eat Smart Foundation Newfoundland and Labrador now provides an estimated 22,000 meals daily to children and youth through its network of 240 Kids Eat Smart Clubs and more than 6,000 volunteers. Kids Eat Smart is a charitable organization whose aim is to help provide children with the nutrition they need to learn, to grow and to be their best. They provide financial support, program support and also volunteer support. • Children need nutritious food to learn, to grow, to be healthy and to be their best. • Children require a community response – a partnership of family, school and community for their healthy development. • All communities are unique, community needs are diverse and communities are their own best experts. Each Kids Eat Smart Clubs are different – some are sit down cafeteria style breakfasts, some are grab-and-go snacks, others are lunch programs – but all serve to ensure that all children within that community have access to nutritious food choices at no charge so they have the energy they need to concentrate and learn. Principals say that Clubs make a positive difference to school attendance, classroom disruptions, and the school atmosphere. Kids Eat Smart Clubs help children grow, learn and be their best. Credit unions are proud to support our communities through organizations like Kids Eat Smart.